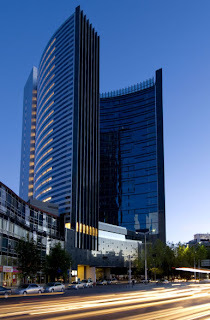 Due to the redesign and recovery of the historic centre of Mexico City, the area of Paseo de la Reforma re-emerges as a beautiful commercial, cultural and historic avenue of the metropolis. 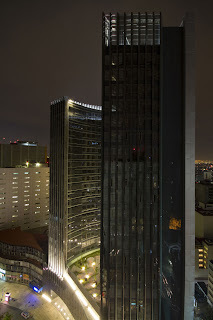 Mexican design firm Migdal Arquitectos has completed a 42,200 sq m residential development in Reforma - Plaza Residences. The building is flanked by two cultural landmarks that enroot it with the historic past of the area, the Monument to Columbus and the Monument to the Revolution. The shape of the building has been designed to give richness and movement to the urban context. In response to the Columbus traffic circle, the building, with its glass interior façade, is erected in the shape of a boomerang, creating a concave interior space. This concave shape opens up and embraces the majestic traffic circle, integrating it into its concept. 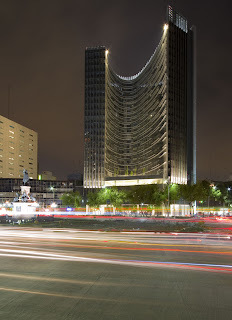 The boomerang shape draws out from a long linear element which constringes into the plot with the intention of presenting a considerable unfolding façade towards Reforma. The building is an abstract entity; its principal façade presents itself as a smooth-skinned glass curtain, permitting, at a glance, the loss of perception of the building's floors. The building's skin is accentuated with randomly placed aluminium mullions, which control the effect of the sun, while creating an interesting effect of light and shadow in the concave shape. The apartment tower is divided into two zones, both with independent access and lobbies, with apartments and suites ranging between 60 and 170 sq m, 4 basement parking lots, common areas for the apartments and a commercial ground floor. 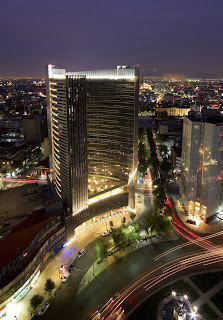 The building accommodates a business centre, fitness centre, projection room, swimming pool with a bird's-eye view of Reforma; a kid's club, lounge, events hall, parking lot, common open-air plaza and technology.